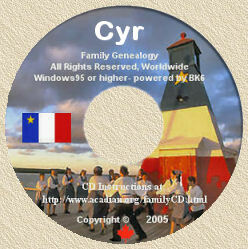 Acadian Genealogy Homepage; Shareware/Freeware programs/utilities included on the Acadian CD-ROM! Following is a list of .ZIP files of Genealogy-Related Shareware/Freeware Software programs/utilities stored in the SOFTWARE Directory of the CD. As noted below, please remember that Shareware programs are provided for your convenience only, have not been paid for and, in the event you decide to continue using a program (usually longer than 30 days), you must pay its Author directly. Also, a reminder to view Mike St. Clair's excellent PAF Review (which provides his extensive description and evaluation of PAF Utilities) in the directory entitled PAFREV. The Genealogy Software/Utilities (.ZIP files) in this directory, are "Shareware" products and, as such, HAVE NOT BEEN PAID FOR! As with all Shareware programs, you are encouraged to "give it a test drive" and then if you continue to use the program, register it with its author directly. The cost is usually very minimal and well-worth the investment. So remember, this "In Search of Our Acadian Roots" CD is merely being used as a medium for distributing the following files AND YOU MUST PAY EACH AUTHOR DIRECTLY! Usually, most Shareware authors will allow you to use their program free of charge for 30 days...after which time you must register the program, or cease using it. While every effort has been made to virus-check each file, it is always a good idea to carry-out your own check BEFORE using ANY new Software. As well, .ZIP Shareware and Utilities are provided as a service and made available for your convenience, but on a "use at your own risk" basis. There is no warranty of any kind, expressed or implied and I will not accept any responsibility whatsoever, for any problem(s) which you may encounter with these products. I recommend you use PKUNZIP.EXE (latest version 2.04g) to unzip/decompress the files however, the file PCDEZIP.EXE (read PCDEZIP.DOC) provided by Mike St. Clair, will apparently handle all varieties of .zips. CSOURCE.ZIP ; 444,017; 12-24-94 ; :32 ; Gedcom "standard" information. GENSOFT.ZIP ; 7,692 ; 2-22-93 ; 21:44; Listing of Genealogy Software Prgs. GENSRCH.ZIP ; 150,338; 12-31-94 ; :03 ; Find common ancestors in GEDCOMS. Note: This is the excellent program created by John Smith, who provided the necessary software for this "In Search of Our Acadian Roots" CD-ROM. GENTIQ11.ZIP; 495,910 ; 9-11-93; 11:42; Demo of French "Geneatique" Prg. MYFMLY.ZIP ; 233,349; 10-24-90; 22:59; My Family Genealogy Prg. RFORMS.ZIP ; 11,757; 10-16-91; 1:06; 941B; PAF Forms Census, etc. NOTE: The program PAF REVIEW (located in the PAFREV sub-directory of the "software" directory) is an _excellent_ program which was prepared and provided by Mike St. Clair and provides Users a very thorough "review" of most Shareware/Freeware Programs/Utilities included on the CD!